Orion was a mighty hunter who has many myths attributed to him; Orion was son of the Sea God Neptune. He was a giant who was able to walk in the sea, with his head above the water. 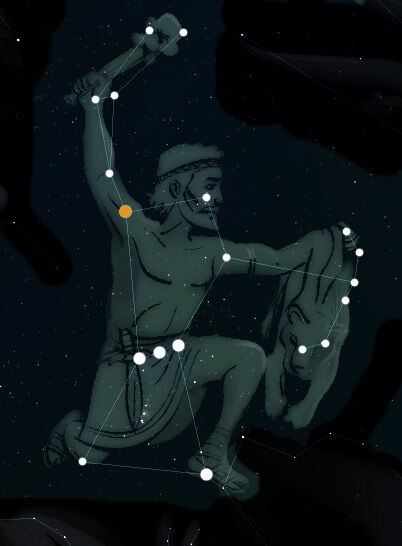 In the night sky Greeks saw him holding a club in one hand and holding a lion skin or shield in the other, he was fighting the bull constellation; Taurus and chasing constellation Pleiades. The constellation Scorpio is positioned so that it opposes him. Sagittarius was placed next to the Scorpion; with his bow aimed at the scorpion's heart, should he try to move towards Orion. The Orion Scorpio story echoes astronomical phenomenon that Orion and the constellation Scorpio each rise as the other sets. Orion is the brightest constellation, so bright that it was said: night, mistaking him for day, folds her dark wings. Orion is the winter constellation par excellence. Orion evolved in the view of the Romans to be armed with a sword, a baldric, wore the military belt and seen as a prime example of a warrior. He portended war by making his sword flare brightly in the sky. Those born when Orion was visible or rising were said to have the characteristics of officers and soldiers. The influence of Orion on the Roman army is discussed in ‘Mithras-Orion: Greek Hero and Roman Army God’ by Michael P. Speidel. ‘Orion loved Merope, the daughter of OEnopion, king of Chios, and sought her in marriage. He cleared the island of wild beasts, and brought the spoils of the chase as presents to his beloved; but as OEnopion constantly deferred his consent, Orion attempted to gain possession of the maiden by violence. Her father, incensed at this conduct, having made Orion drunk, deprived him of his sight and cast him out on the seashore. The blinded hero followed the sound, of a Cyclops' hammer till he reached Lemnos, and came to the forge of Vulcan, who, taking pity on him, gave him Kedalion, one of his men, to be his guide to the abode of the sun. Placing Kedalion on his shoulders, Orion proceeded to the east, and there meeting the sun-god, was restored to sight by his beam. After this he dwelt as a hunter with Diana, with whom he was a favorite, and it is even said she was about to marry him. Her brother was highly displeased and often chided her, but to no purpose. One day, observing Orion wading through the sea with his head just above the water, Apollo pointed it out to his sister and maintained that she could not hit that black thing on the sea. The archer-goddess discharged a shaft with fatal aim. The waves rolled the dead body of Orion to the land, and bewailing her fatal error with many tears, Diana placed him among the stars, where he appears as a giant, with a girdle, sword, lion's skin, and club. Sirius, his dog, follows him, and the Pleiades fly before him. The Pleiades were daughters of Atlas, and nymphs of Diana's train. One day Orion saw them and became enamored and pursued them. In their distress they prayed to the gods to change their form, and Jupiter in pity turned them into pigeons, and then made them a constellation in the sky. Though their number was seven, only six stars are visible, for Electra, one of them, it is said left her place that she might not behold the ruin of Troy, for that city was founded by her son Dardanus. The sight had such an effect on her sisters that they have looked pale ever since <1>. In another version of the story is when Orion threatens to kill all beasts on the earth Gaea -Earth became angry and created a giant scorpion that killed Orion by its sting. Zeus on request on Artemis and Leto placed Orion in sky and to mark his bravery placed Scorpio in the sky also. The origin of name the Orion relates to one his birth stories, which Hyrieus of Thebes asks for gift of fatherhood of his guests Mercury and Jupiter. He offered them an Ox for their feast and Mercury and Jupiter accepted the offering and instructed him to remove the ox hide, they then urinate on the ox hide and instructed him to bury it. Some time later a boy was born who Hyrieus called Urion (urine born) <2>. The rising and setting of the constellation of Orion was thought to be followed by storms and rain. There has been a great deal written about Orion by modern writers, for example the book ‘The Orion Mystery’ by Robert Bauval and Adrian Gilbert, looks at the link between position of the Giza pyramids and the major stars of Orion. The Giza site offers a good example of archaeoastronomy. Build around 3000B.C. the pyramids are aligned to the compass directions, each side faces east, west, north, abd south perfectly. Furthermore, at 3000B.C. the pole star was Thuban in constellation Draco, meaning passages in the north face of the pyramids emerge to pointed at this star. One theory is that the Giza site was designed to mirror the sky, the three pyramids represent belt stars of constellation Orion, the Sphinx is constellation Leo and the Nile the Milky Way. Orion here is seen as Osiris, the God of the underworld and resurrection <3>. However, view of Orion in the Egyptian religion being Osiris is a controversial one, as some hold the view Orion was seen as Horus, son of Osiris. This controversy has little effect on the archaeoastronomy of the Giza site, as either way it demonstrate the importance of the stars to Egyptian religion. ‘For when the Egyptians themselves tell us that Hermes had one hand shorter than another, that Typhon was of red complexion, Horus fair, and Osiris black, does not this show that they were of the human species, and subject to the same accidents as all other men? Nay, they go farther, and even declare the particular work in which each was engaged whilst alive. Thus they say that Osiris was a general, that Canopus, from whom the star took its name, was a pilot, and that the ship which the Greeks call Argo, being made in imitation of the ship of Osiris, was, in honor of him, turned into a constellation and placed near Orion and the Dog-star, the former being sacred to Horus and the latter to Isis <4>. The above passage assigns Horus to Orion, Isis to Sirius, and Osiris to Canopus/Argo. Further arguments for Orion being Horus and Canopus being Osiris can found in ‘The Canopus Revelation: The Stargate of the Gods and the Ark of Osiris.’ by Philip Coppens. In my view, the Greek/Roman myths of Orion better align with myths of Horus than those of Osiris. For example both Greek/Roman Orion and Egyptian Horus are great warriors. Orion is chasing the daughters of Atlas the seven sisters: the constellation Pleiades, while Horus is partnered with Hathor (seven Hathors being Pleiades). Orion loses his sight and Horus loses an eye, both have their vision healed. Finally, Orion and Horus also both get bitten by a scorpion. Some other world myths also see Orion as a warrior, for example in Epic of Gilgamesh, the Bull of Heaven (the constellation Taurus) is killed by Gilgamesh (Orion) and his friend Enkidu. In short, constellation Orion be it the Greek Giant hunter, or the Roman solider, or Egyptian Horus warrior, all play on the same warrior god theme. We are looking edgewise into the disk of the Milky Way galaxy. The center of the galaxy is in just the opposite direction. So we are looking outward along one of the spiral arms of the galaxy. There are fewer stars in this direction, but those that are there are generally closer, and many are brighter. Certainly there are a good number of interesting stars and other deep-sky objects to consider. Rigel and Betelgeuse are the two brightest stars in Orion, which is the only constellation within our vision to boast of two first-magnitude stars. The only other such constellation is Centaurus, which can be seen only from southern skies. In addition, Bellatrix, Alnilam, and Alnitak (Gamma, Epsilon, and Zeta Orionis) shine at magnitudes between 1 and 2, with Saiph (Kappa Orionis) at magnitude 2.05 close behind in the list of 51 brightest stars. Together, these stars form one of the most distinctive of all constellations. Betelgeuse is Alpha Orionis, although Rigel (Beta) is a little brighter, on average. Betelgeuse pulsates irregularly, varying from a brightest 0.4 to about 1.2. The two stars are at about the same distance from us, about 1400 light years. The two are quite different, however. Rigel is a hot blue supergiant star, burning its hydrogen fuel at a prodigious rate. About 50 times the mass of the Sun, it is 57,000 times as luminous. Betelgeuse is a red giant, so huge that its diameter has been measured by direct interferometer means. It would encompass the orbit of Mars if it were placed at our Sun's position. 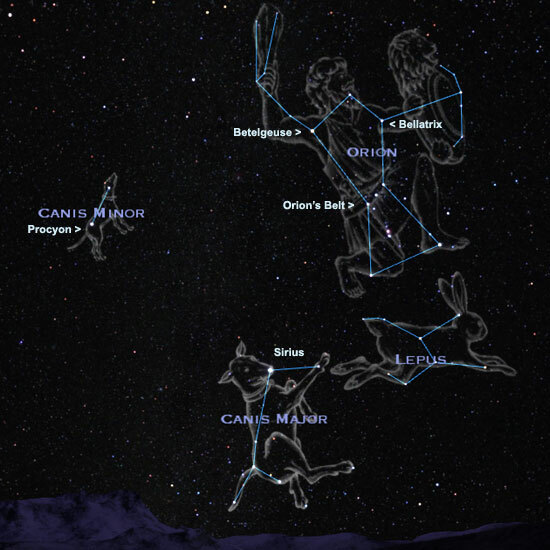 The three stars that form Orion's belt, prominent in the sky mythology of a number of cultures, are Delta, Epsilon, and Zeta Orionis, from northwest to southeast. Their respective names are Mintaka, Alnilam, and Alnitak. For the Chumash Indians of California these stars were simply called Three In a Row, and their location in the sky served as a calendar to mark ritual events. Of these three stars of Orion's belt, Mintaka has the distinction of having a declination of almost exactly zero; its rising marks the east on the horizon, its setting the west. So it is not surprising that this star was of special consideration to astrologers, who avowed that it meant good fortune. The Great Orion Nebula, M42, is a huge interstellar gas cloud 20,000 times the diameter of our solar system. Here stars like our Sun are being born; as they ignite, their radiation causes the gas cloud to glow with different colors. 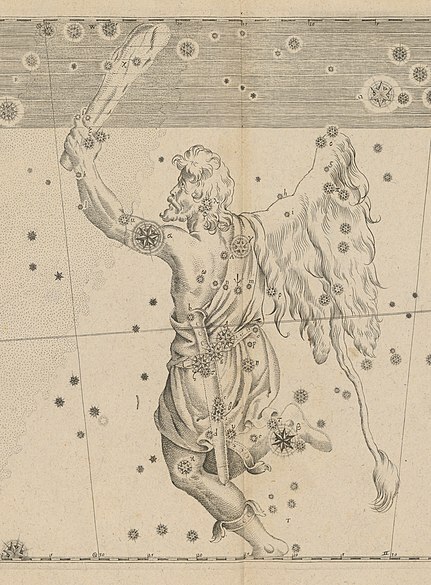 A print of the copperplate engraving for Johann Bayer's Uranometria (1661) showing the constellation Orion.